What is the state of mind of Internet users in the world? As we might have guessed, money cannot buy happiness: the richest are not especially the happiest, and poorest are not the grumpiest. Thanks to Emolytics, it is possible to establish the top 20 most optimistic countries as well as the top 20 saddest countries in the world. During 2015, more than 440,000 people from 199 countries around the globe answered the Emolytics surveys on websites or in emails. 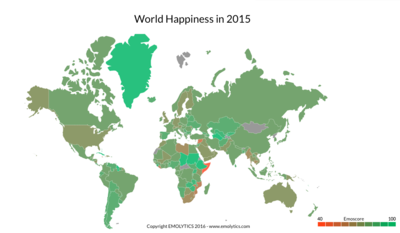 From this data, Emolytics was able to find the happiest and saddest countries in the world for that year. Here are the top and bottom 20 results. The results are quite insightful and surprising as very few European countries are represented (only 3, with just one of so-called “western Europe”), while Latin America and Africa, with their legendary tradition of joie de vivre are the best represented with 7 countries from Latin America and 7 for Africa (3 of which being in the top 5), respectively. Asia is close to Europe with only 3 countries represented. The most represented regions in the bottom 20 are Europe with 8 nations and the Middle East with 4 countries, followed by Asia (3 countries), the Caribbean (2 islands), Africa (2 countries) and Latin America (1 country). It is worth noting that the USA is at the 21st position in this ranking of the saddest countries in the world. The wealthiest countries of the world seem to be among the least positive regions to live in. France is at 83th position, just ahead of Japan and Ireland. On the other hand, Belgium is at position 94 in the ranking, behind India, Russia and Israel, but just before Canada. Spain is near to the top of the ranking, at the 25th position, with a small advance on Brazil (36th) but far ahead of Portugal that is only at number 59 of the happiest countries of the world, just behind Netherlands at the 58th position. As you zoom in on the map, you will also notice that Syria and Somalia are deep in the red. We did not included them in our bottom 20 as the sample size was not relevant enough (people there certainly have certainly other things to do than completing web surveys) but with a higher sample size, there is little doubt those countries would have made the bottom 5 of our ranking. What is the happiest and saddest week of the year? The happiest and saddest period of the year has always been subject to discussion in popular literature, and Emolytics finally comes with empirical data. Some patterns can be found in some behaviours, as David McCandless showed, with the most frequent period of romance break-ups peaking at the end of February and beginning of March and two weeks before Christmas. 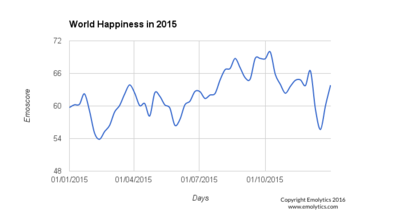 That pattern in world population happiness seems to be observed again with Emolytics data as it appears that February is the saddest period of the year, along with mid-December, just before a peak in happiness for the end-of-year celebrations. On the other hand, the happiest period of the year is clearly observed at the end of summer. A last but yet fundamental question for many readers remains: what is the happiest day of the week? Unsurprisingly enough, it appears that common sense prevails here: the end of the week is always preferred to the first days of the week, while we have a small peak of hope and happiness on Wednesday. Monday is definitely the most depressing day of the week. How were those data collected and computed? Emolytics collect its data from thousands of websites owned by its clients or from other channels such as emails. 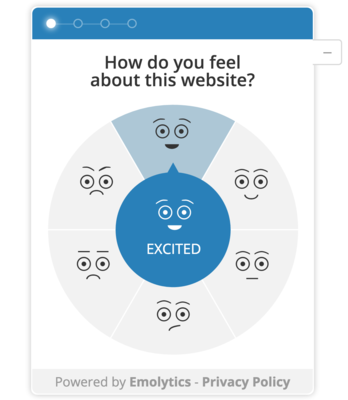 The surveys are displayed as engaging and high response rate survey modules, as seen below. 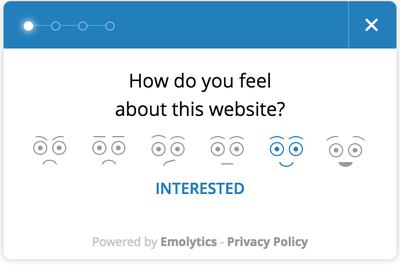 Emolytics then used its unique and proprietary KPIs: the Emoscore © (gauging the emotional impact of a content, based on years of research in psychology and into emotional valence and arousal) and the Net Positivity Index (NPI) which is the difference of the proportion of positive individuals with the proportion of negative individuals (similar in some ways to the Net Promoter Score (NPS). We also only kept the countries where the number of votes was high enough to have a relevant error margin. That was made possible by the huge response rate to of our engaging surveys that have collected millions of answers to date.